Pizza Ponte serves Sicilian pizza by the slice — and much more — to guests in Disney Springs! Pizza Ponte is one of a trio of restaurants connected by setting and story. Along with Maria & Enzo’s and Enzo’s Hideaway, these three restaurants serve Italian cuisine, each in their own way. Pizza Ponte offers a fast-casual component, giving visitors a chance to grab a quick slice of Sicilian pizza, as well as Italian sandwiches and pastries. 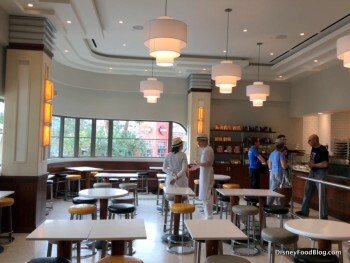 Disney Dining Plan: It is not currently accepting the Dining Plan in its earliest weeks of operation, but is anticipated to accept Counter Service credits sometime in very early 2018. Even though pizza is the headliner, Pizza Ponte opens at 8:00 AM to serve breakfast items like Italian pastries and specialty coffees. Where to Get Free Pizza in Disney World This Friday! !